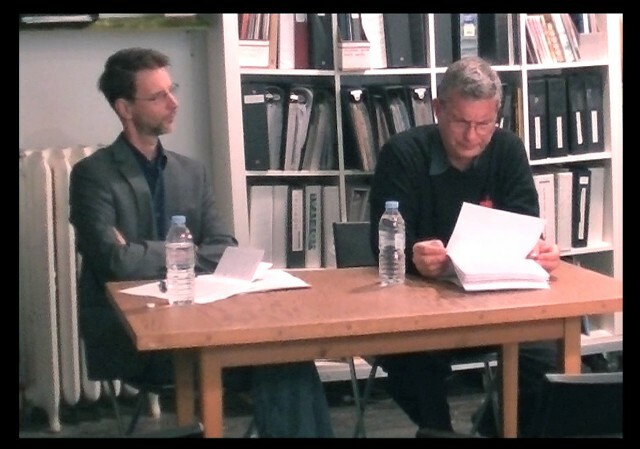 As part of the discursive programming for this project, a panel discussion was convened. This comprised two critics who would each read a paper on the project. The critics were introduced as Carl Samuels, a New York-based critic, and Patrice Loubier, based in Montreal. Samuels reads his paper, a somewhat bombastic rejection of the project. Loubier reads second, and it gradually becomes apparent that this second paper is a word-for-word repetition of the previous presentation. This performance is both a reconfiguration of the project's initial gesture of appropriation, and a response to articule's acceptance of the project. The critics' scripted text critiques the project on its failure to incite conflict with the institution. It asks, what does it mean for a work of critique to be accepted by an institution? Does an acceptance indicate a failure to encounter a limit? To listen to a podcast of the event with discussion, please go to articule's website. During the discussion it was revealed that Carl Samuels is actually the artist's father, Carl Schwebel.